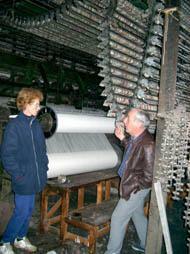 Goodacres Carpets (of Kendal) has been weaving Spool Axminster in the mill between the river and canal in Kendal for over 50 years. The founder – William Goodacre – reached Kendal from London via Holme Mills to take over the old established mill in the 1930’s, weaving chenille at first, then narrow loom Axminster after the Second World War, then broadloom in the 1950’s in widths of 9’, 10’6″, and 12’. The mill sources yarns from around the world. Darker yarns for darker blends (colours), dark grey becoming burgundy for example. Only 10% of production is all wool, the rest is 80% wool/20% nylon which has already been mixed in during the spinning process before reaching the mill. The jumbo hanks of oily yarn are scoured (washed) in a mixture of sodium bicarbonate and detergent, through four baths with repeated soaking and squeezing. 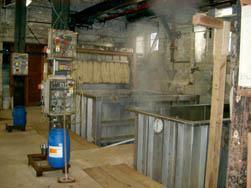 They are then transferred on stainless steel rods to the dye house. Here 8 vats of different sizes, all used approximately twice a day, handle 20,000 lbs of yarn per week. Different yarns need different chemicals to produce different blends, with each load taking about an hour to produce the blend required. Automatic colour testing procedures calculate whether more or less time is needed. 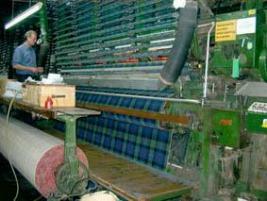 The damp wool is then loaded into hydros (spin driers), then on a frame into a drier and then to the winding department where 3 machines take 6 hanks each to produce 5 bobbins from each hank. 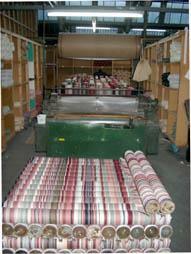 The bobbins of different coloured wools are transferred to the setting department. Here (in the old weaving shed with north facing lights) the spool setters follow a pattern from the design shop and feed the correct colours of yarn onto a “spool” which will later in the process create one row of the pattern. The quality of the finished product is determined by the number of rows in a 3’ repeat – an amazing 342 of them in the best quality Royal Kendal. 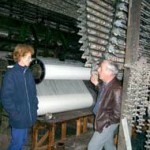 The spools are individually loaded onto the massive chain driven mechanism which feeds the weaving operation of the loom. Here the three main ingredients come together in one operation – cotton warp, jute weft and the wool – and combine to make one row of carpet. Then again for another, and another – at the rate of 3 yards an hour.The “weaver” at the front monitoring the operation, and the “tuner” at the back checking the feed. 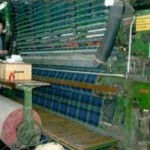 The woven carpet is checked for mistakes, repaired if necessary, the pile is brushed, steamed and brushed again. 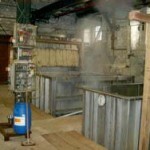 Latex is inserted into the base and baked in the oven, and the cropping machine ensures an even finish. The carpet is graded, measured, and stored as rolls on racks. The whole process takes about 10 days from start to finish, and employs 160 operatives.